A must for this platter of Mediterranean goodies is California Lavash. 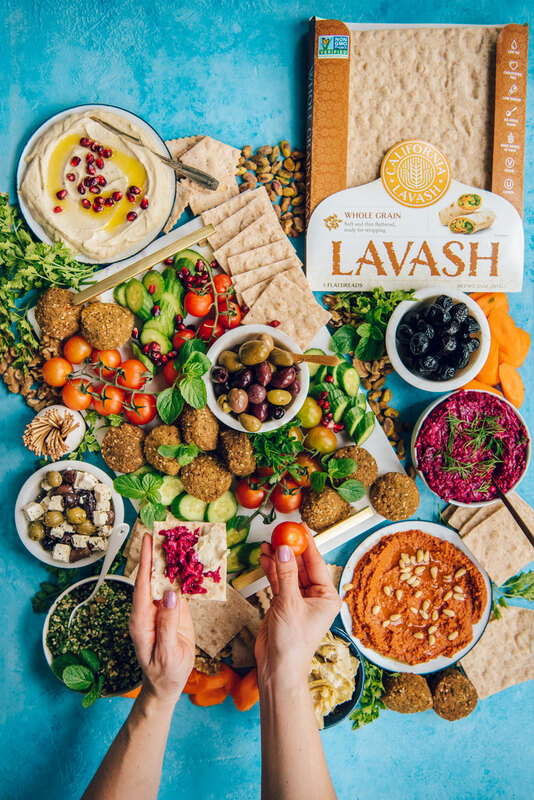 If you haven’t heard of lavash, prepare to have your life changed forever! Lavash is the flatbread you’ve been waiting for. It’s soft, thinner than pita and very tender. It’s the perfect vessel for getting all the amazing food you’re serving into your guests’ mouths. Mezze platters tend to be very dip heavy, so lavash is essential. The lavash comes in sheets so I just cut them up into smaller rectangles for serving. California Lavash bakes real lavash right here in California with traditional methods that require time, patience and expertise. They are committed to quality – just read the ingredient list! You’ll find whole ingredients with no artificial preservatives. Because they have no preservatives, lavash stay freshest if kept frozen. They will stay fresh in the freezer for months. When you are ready to use them, they will thaw out on the counter in just a few minutes. California Lavash is available in the bread aisle at grocery stores like Safeway, Whole Foods and Sprouts. Here in San Francisco, we get it delivered right to our door with Good Eggs! You can find it in a store near you using their convenient store locator. 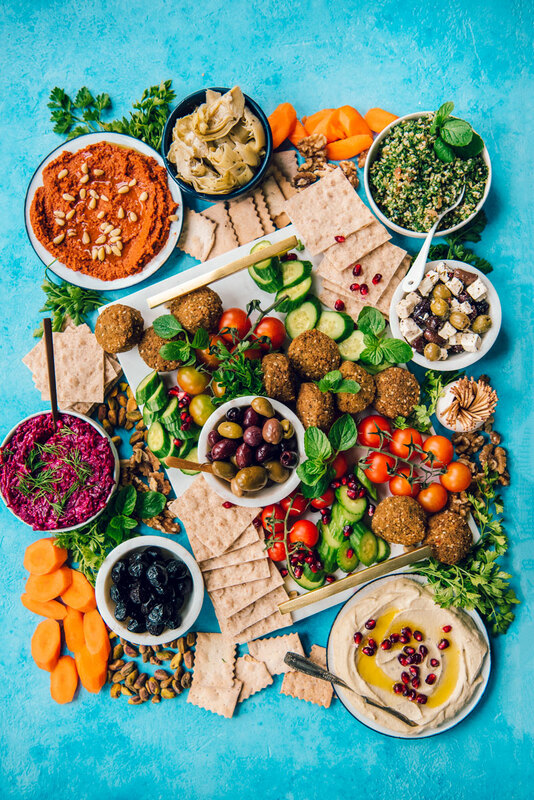 If you’re wondering what to put on a mezze or hummus platter, the sky is the limit! 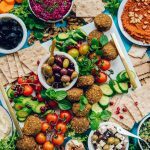 I’ve included a list of my favorites below, but in general I would focus on an assortment of spreads and dips, some fresh vegetables, nuts, feta and olives. 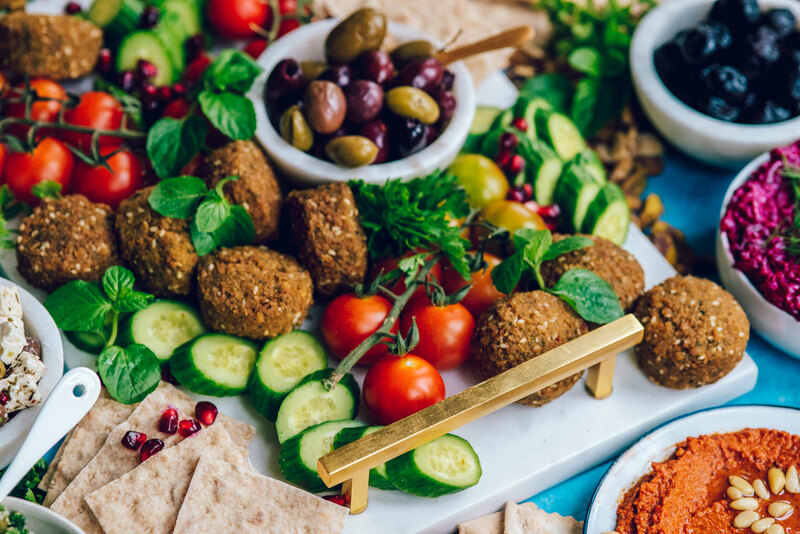 Falafel is also a staple and is an easy way to make a platter feel more substantial. 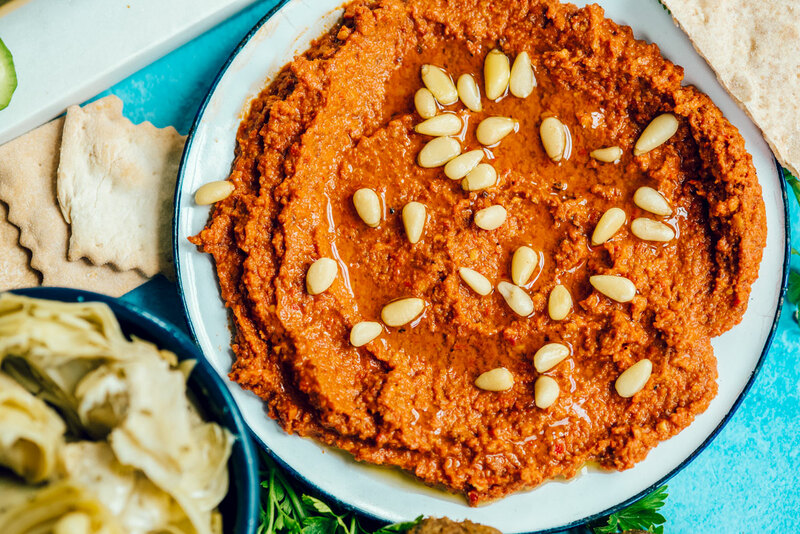 We’ve really been loving muhammara dip lately as a spicy and flavorful alternative to hummus. This traditional Middle Eastern dip is made with roasted red peppers and walnuts. It packs a big punch and will add a lovely pop of color to your mezze platter. 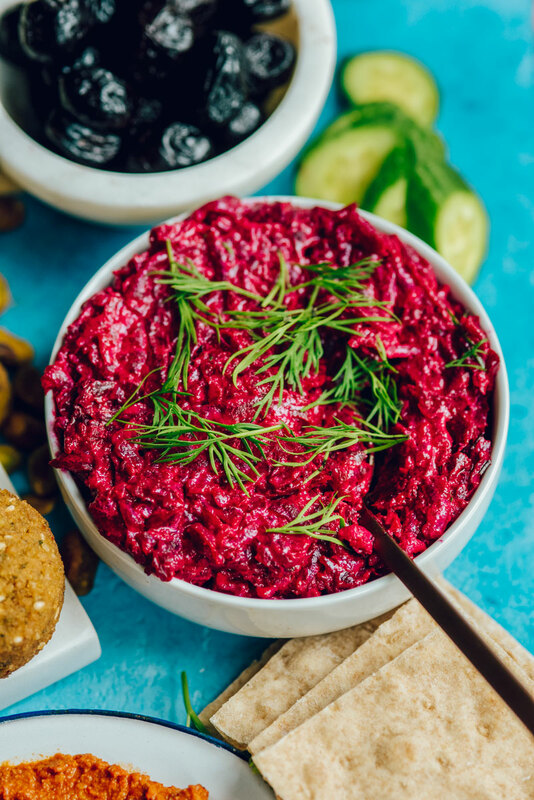 I’ve been wanting to share this beet dip with you for a long time. It was an integral component to one of the most memorable meals I’ve ever had. In residency, I did a research rotation at Children’s Hospital of Philadelphia. My grant came with a modest per diem. I lived on granola bars and snacks for breakfast and lunch so I could spend the entire amount on a nice dinner in Philadelphia. Highly recommended by everyone I talked to was Zahav, an Israeli restaurant by Chef Michael Solomon. The entire restaurant was completely booked, but one of the perks of traveling alone is that I was able to snag a seat at the bar for dinner. That time I got the tasting menu at @zahavrestaurant and it was insanely delicious. And I had to make friends so I would have help eating it. The star of the tasting menu is Chef Solomon’s mezze platters, including this amazing tahini dip with salt roasted beets. This dip will impress even the most avid beet-hater in your midst. The earthiness of the beets is balanced by the pleasant bitterness of the tahini to make the smoothest most flavorful dip experience you’ve ever had. 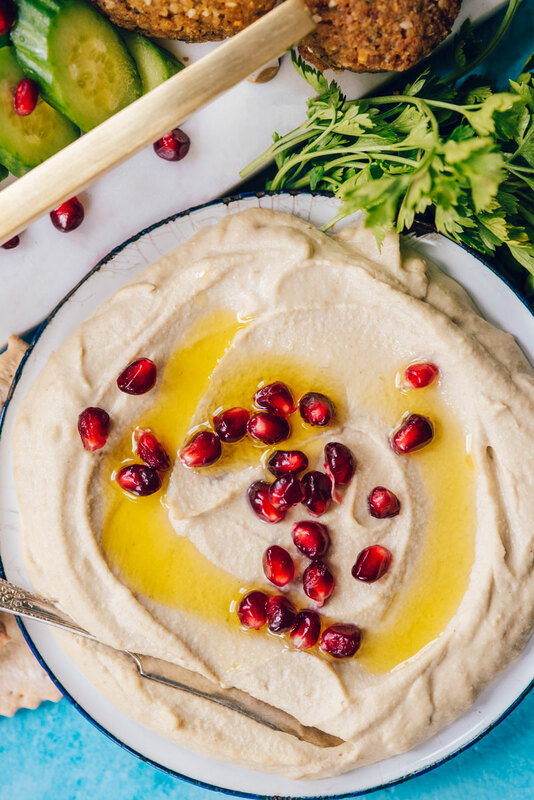 Luckily there’s now a Zahav cookbook, so you can make this dip for yourself! There are a few steps involved, but I promise you it’s worth it. Like I said, I’m a total foodie and it’s one of the most memorable things I’ve ever eaten. The recipe below makes enough tehina sauce that you can also easily make your own hummus as well with just a few extra steps. I use the recipe from the Zahav cookbook for that as well. 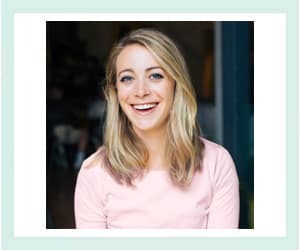 By no means are these recipes required for a mezze platter. You can keep things super simple with store-bought dips and salads too. Between you and me, there’s a hidden benefit of making this for your party. 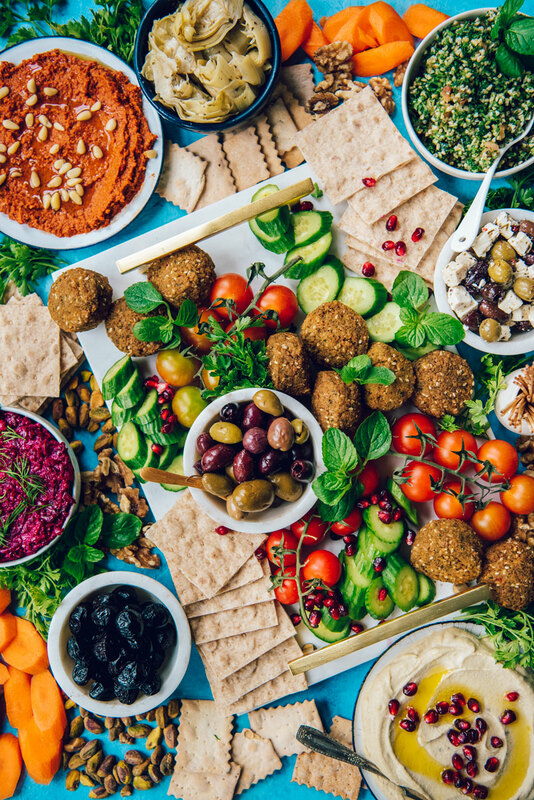 Mezze platters make for exceptional leftovers. 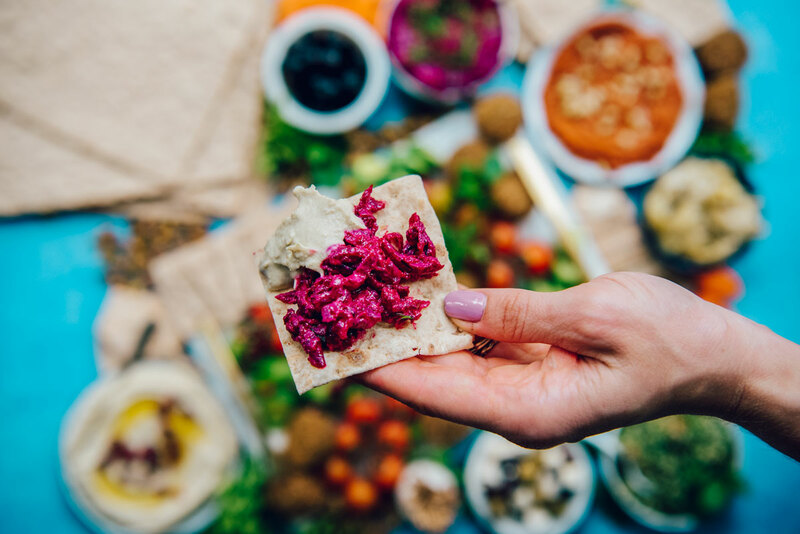 You can enjoy each dish individually, or even better, arrange it on a piece of lavash for a makeshift Mediterranean wrap. They make great leftovers for work too. I just pack the lavash separately and put everything else in a glass container. 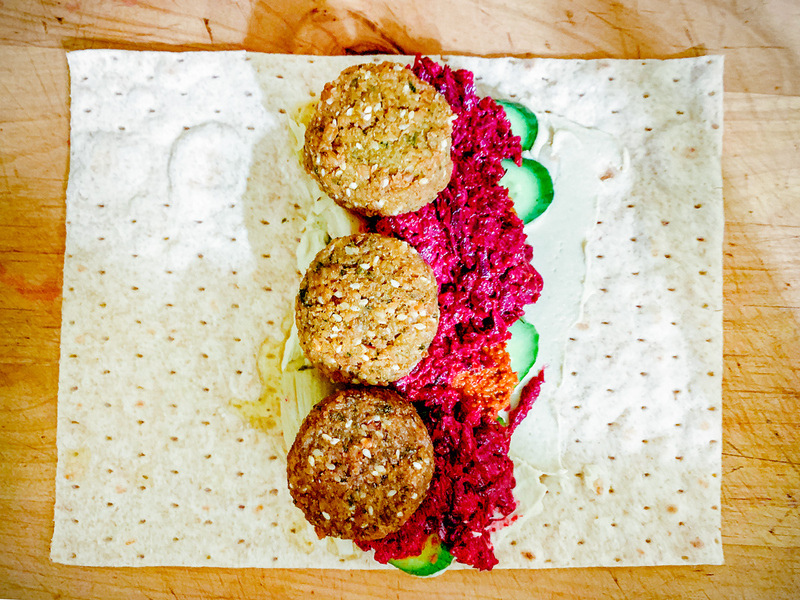 Pro tip – for a softer, easier to roll lavash, cover a sheet with a damp paper towel and microwave 10-15 seconds. Here’s some blurry iPhone proof of me devouring a wrap for dinner the next night. I love hosting a party that leaves me with amazing leftovers. Lavash is so versatile, we use it for everything from pizza to tortilla roll ups. It’s also great baked to use as crackers for snacking or dipping. You can find more recipes at CaliforniaLavash.com. 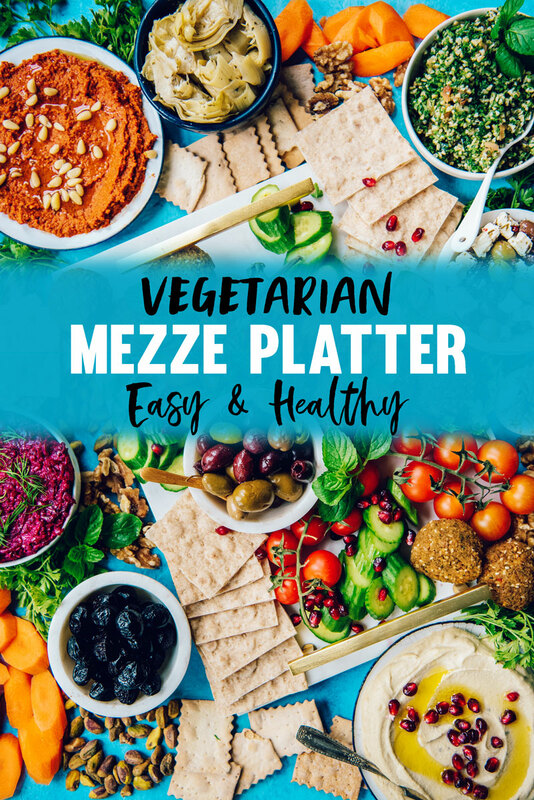 Spice up your next party with a healthy vegetarian Mezze Platter with hummus, lavash, feta and veggies. Makes an amazing easy appetizer! 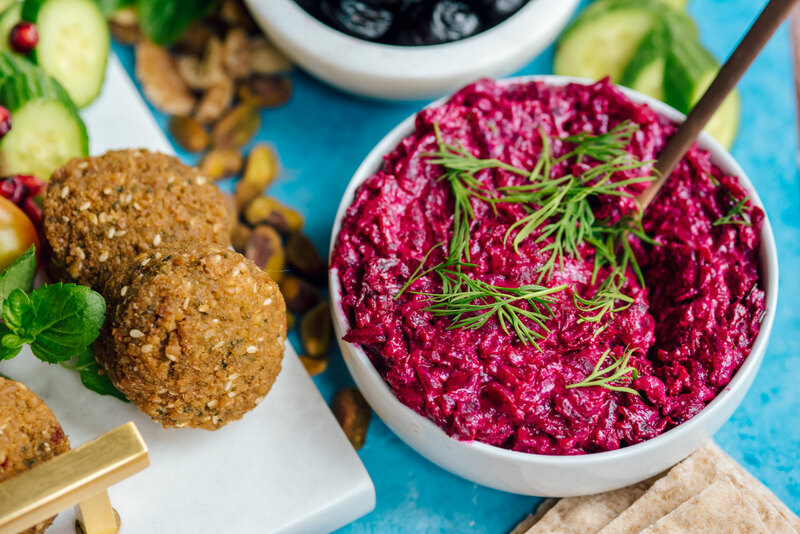 Creamy beet dip recipe from the Zahav Cookbook. Arrange all ingredients on a large platter. What were you thinking it would be more complicated than that? Preheat oven to 375° Fahrenheit. Spread 1 cup of the salt in an ovenproof skillet or baking dish. Put the beets on the salt and cover with the remaining 4 cups of salt. Bake until the beets are tender, about 90 minutes. Meanwhile, make the tehina sauce. Break up the head of garlic with your hands, letting the unpeeled cloves fall into a blender. Add the lemon juice and 1/2 teaspoon of the salt. Blend on high for a few seconds until you have a coarse puree. Let the mixture stand for 10 minutes to let the garlic mellow. Pour the mixture through a fine-mesh strainer set over a large mixing bowl, pressing on the solids to extract as much liquid as possible. Discard the solids. Add the tehina to the strained lemon juice in the bowl, along with the cumin and 1 teaspoon of the salt. Mix together in a food processor until smooth, adding ice water a few tablespoons at a time, to thin it out. The sauce will lighten in color as you blend. When the tehina seizes up or tightens, keep adding ice water, bit by bit (abut 1 1/2 cups in total), processing until you have a perfectly smooth, creamy, thick sauce. This step can also be done by hand if you’re up for an arm workout. Taste and add up to 1 1/2 teaspoons more salt and cumin if you like. If you’re not using the sauce immediately, whisk in a few tablespoons of ice water to loosen it before refrigerating. The tehina sauce will keep a week refrigerated, or can be frozen up to a month. When the beets are cool enough to handle, remove the beets from the salt and peep. Set them aside to cool completely. Grate the beets into a mixing bowl using the coarse holes of a box grater. Add 1/2 cup tehina sauce, oil, lemon juice, dill and mint and season with 1/2 teaspoon salt. Mix well to blend. Top with more chopped dill and mint and serve at room temperature or cold. This post is sponsored by California Lavash. Thanks for supporting the sponsors that allow me to bring you beautiful and delicious content! Need more ways to use lavash? 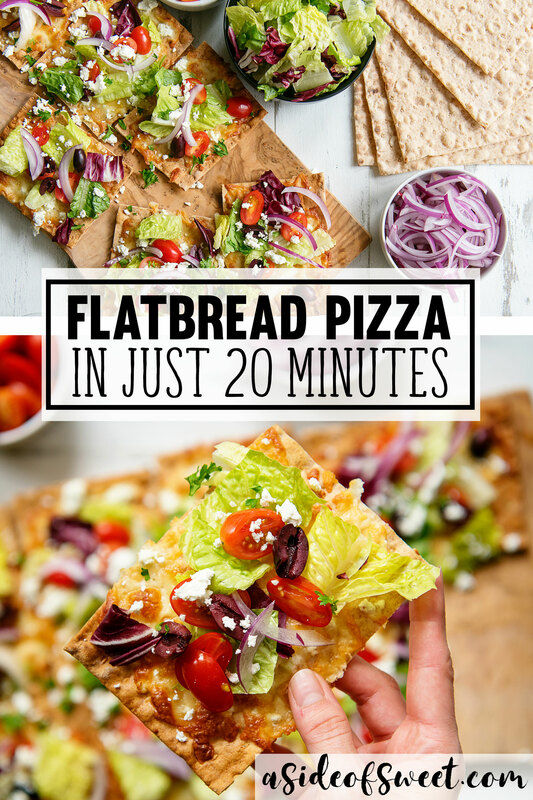 Try this healthy Lavash Flatbread Pizza Recipe!